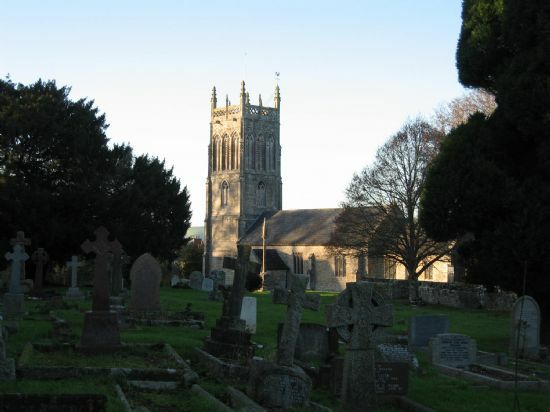 The church, dedicated to St Gregory the Great, was built c1480 but there would have been previous buildings on the site, and we have a list of rectors and vicars from 1309. 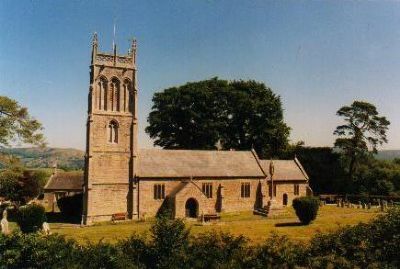 The building was restored in 1846-8 (roof, extra aisle - the "Farmers Aisle" added and a vestry) and again in 1901 (Chancel arrangements, much stonework and window glass. There are three tiny pieces of early glass (1480-1500) in the side aisle). The Communion Table, introduced late last century, is a Jacobean chest which once had what were described as garish pictures on the panels: the chest was turned round about 30 years ago - the pictures have vanished. 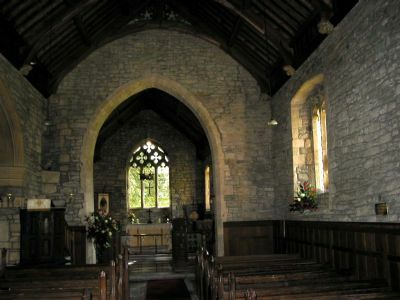 The chancel paving, rails, and carved stalls representing the life of Gregory the Great were given in 1901 by the Luttrell family, who then lived in Badgworth Court. The stalls were the work of the Pinwill sisters, who had a woodcarving studio in Devon. The font is Norman, about 1150, older than our present building. The pulpit is good Jacobean, dated 1617, and by it is the iron frame for an hour-glass for regulating sermons. The owl is meant to deter bats: he doesn't. They love him dearly. The date on the latch of the entrance-door is 1755; the hat peg in the porch is dated 1690. In 1868 Henry Barker, the Vicar, gave a 4-stop organ "in place of the barrel-organ", and the present organ is dated 1885. Other musicians also help us in worship nowadays. The churchyard -cross (1350?) had a top added between the two Wars. Look outside for the marks of two sundials on the SW corner of the tower - and a modern one for the Millenium above the porch. Also look for the hours of Mass by the chancel door.